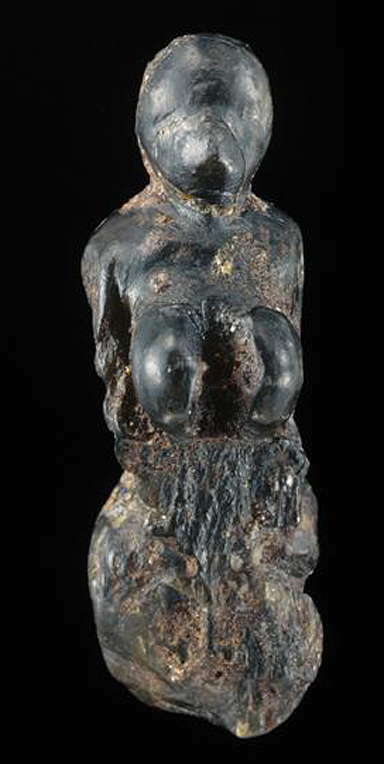 The Undescribed Figurine is of opaque green soapstone. The oval head and the torso are of normal form and proportions, but the facial features are sketchy, with just sockets for eyes and the outline of a nose. The neck is well formed, the breasts, highly elongated from top to bottom, are separated from each other and the rest of the chest by very deep incisions. Two other deep incisions separate the trunk from the mass of the buttocks, strongly projected backwards, giving the small of the back a very high arch, similar to that of the Polichinelle and the statues of Tursac and Sireuil. It measures 37.5 mm. high, 12 mm. maximum width and maximum 13 thickness - both the last at the pelvis - and is made of a quite opaque green soapstone and unlike the other Balzi Rossi examples, breaks with a fibrous appearance, especially in the region of the abdomen, which was removed by a large fracture. This was explained by Piette in a rather fanciful way: It has this peculiarity that it must have been originally in schistose rock, but having been placed in a layer of of iron oxide that the cave dwellers brought in large quantities in the cave, there it was transformed. The material has changed in nature, and in part has converted to iron hydroxide, while maintaining the fibrous appearance of the original rock. 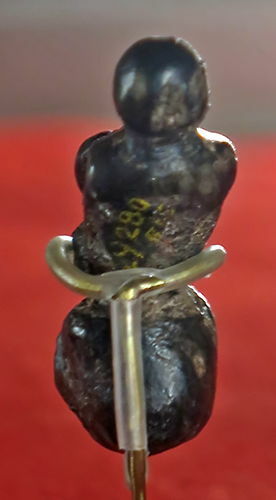 The lower part is broken, we can not know if the statue was in a semi-sitting or standing position, or what was the form of the legs. The surface of the piece is less polished than others in the series, and is also much encrusted with iron concretions. The Undescribed Figure (MAN no 49.280 bis), was also sold by Jullien to Piette, but if we are to believe the latter, at a time later than the others. It is not described in the article of 1902, which is surprising. 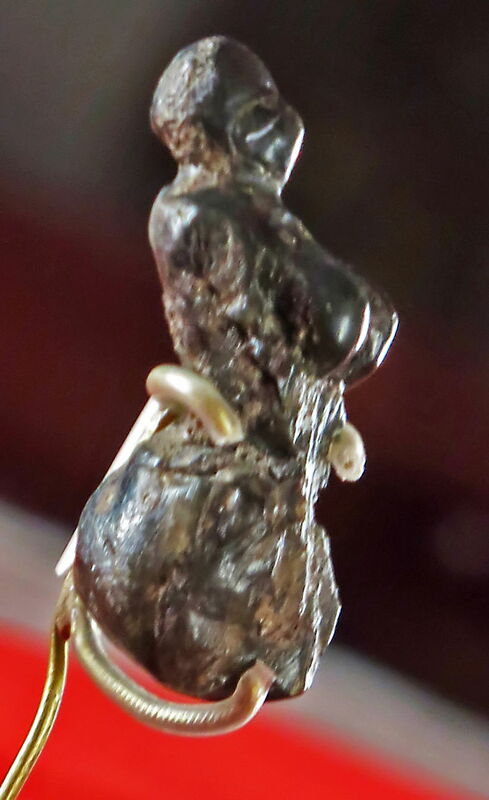 The Venus known as 'The Undescribed Figurine', made of soapstone. Dimensions: height 37.5 mm, width 12 mm, thickness. 13 mm. The Undescribed Venus, rear view.